Australian media coverage (or lack thereof) of nuclear/uranium issues is also affected by Australia’s media monopolies. Just two great corporations control the majority of Australian newspapers. Television and radio ownership is similarly concentrated, And linked to newspaper ownership. Australia’s ABC and SBS television and radio are independent, but are all too well aware of the pressures upon them, and the accusations of bias, should they offer critical insights into Australian industry. (Similarly, they are obliged to provide a platform for industry – which is fair enough). Clare Booth Luce observed, may decades ago, that “one doesn’t need to put chains on people, if one can put chains on their minds”. So, many journalists just know how their employers want the story to be covered, or more often, not covered at all. A pervasive attitude develops – that it is somehow “radical”, or “unpatriotic” to raise objections to a big industry. So, print, TV, radio journalists find it all too easy to toe the corporate line. After all, it’s much more fun to cover issues like the sexploits of a sports celebrity, anyway, – than to cover the nuclear issue and its meaning for the children and grand-children of the future. Toeing the corporate line is also easier for Australian journalists than doing actual investigative journalism. The nuclear/uranium industry is so easy to cover from the comfort of Canberra, or Sydney, using industry and government media releases. Much harder to tramp around the backblocks of South Australia (without guiding hand of BHP Billiton) and check out the industry st first hand, and write something original. So – the combination of media ownership in the hands of a few corporations, journalists’ fear of stepping out of line, and the good old reliable Australian apathy – result in the mainstream media’s no, or poor, coverage of the nuclear/uranium industry. There are other ways in which we are poorly served here. Headlines are often deliberately misleading. For example, when a poll asked Australian if they would “consider” nuclear power – many headlines screamed “Australian want nuclear power”. But the most important influence of all on the Australian media has been the impact of the PR machine of the “think tanks”, such as the Institute of Public Affairs and The Centre for Independent Studies – they are able to get wide media coverage. Independent media in Australia – sorely needed, in view of Australia’s media monopolies, and the corporate grip on information – in this land dedicated as Quarry and Waste Dump of the world. There are few listings for Australian alternative media. You can find a selection of political news sources on this Hubway page. Community Broadcasting Online provides background information and links to Australian community radio and television. Alternative Radio is a source for public affairs programming which is made available without charge to all public radio stations. For international listings of alternative press and alternative viewpoint sites, see the Alternative Press Center and Green Left Weekly. The Internet provides the opportunity for alternative and independent news. Mainstream corporate media clearly has its bias, – best evidenced in the issues that it DOESN’T COVER, but also in its role as corporate (or government) mouthpiece, and in its focus on (saleable) trivia and sensationalism. Alternative media has its biases, too – all media comes from some opinion base. But bias does not mean that the information is false or worthless. The best rule for evaluating any media coverage is simply “WHAT”S IN IT FOR WHOM?” If the answer is MONEY, then we must view the item with scepticism. (And that applies to much corporate media “information”). But there are other biases – e.g. fame, hatred, anti-science, religion … so alternative media must be scrutinised , too. organization.It’s always – “Let the viewer beware”. So i’s always necessary to assess alternative media items, too – Does it make sense?, Does it use inflammatory or extreme language? Does it quote reputable sources? What’s in it for whom? There are so many independent websites and blogs. On scrutiny, we can assess their credibility, and their bias. Very often, the bias is a passion for revealing the truth. “Australians warm to nuclear power” Brisbane Times IAN MUNRO AND GEOFF STRONG October 13, 2009 “. Possibly due to journalists’ ignorance of science, great credibility is given to the opinions of nuclear physicists, such as Ziggy Switkowski, or Leslie Kemeny, even when they speak on areas on which they have no expertise – such as ecology, or biology, radiation effects on living cells. 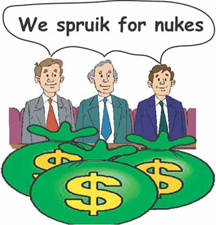 Also ignored is the obvious vested interest when nuclear experts are clearly paid for by nuclear institutions. Your editorial (”Nuclear logical if pollies are game”, July 23, p10) asserts that risks of nuclear power accidents and problems of waste disposal are ”exploited by an assortment of left-wing ideologues, ratbags and environmentalists to stifle any meaningful debate”.Do you imply that a ”meaningful debate” would ignore these legitimate problems?What about other problems, such as nuclear weapons proliferation, cost, long time leads and the greater all-round merits of energy efficiency? Is it ”exploitative” to raise these issues in debate? The Canberra Times regularly features fact-light articles by nuclear power advocate Leslie Kemeny that ignore many of these problems, and the Times either does not publish or gives less prominence to articles offering a more informed and comprehensive view. I think you make it clear, by your emotive language, by your actions and by your gatekeeper position, who are the ratbag ideologues stifling meaningful debate.